Hey, remember that video of the Nissan Patrol being towed by the R/C truck? Yeah, well we got more videos and information about the person who developed that 1:4 R/C beast. The brain behind the truck was Italian born and bred Bordin Luca. Luca is an American truck enthusiast, with his favourite being the Peterbilt 359. 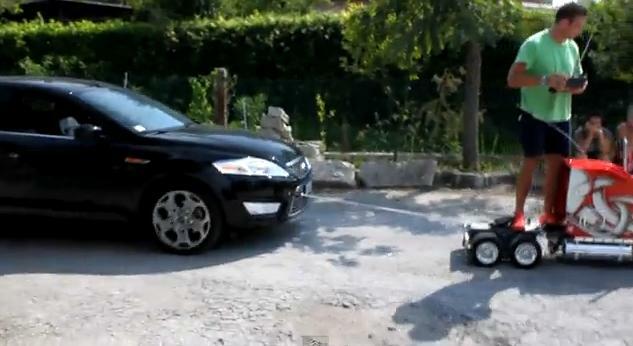 He saw an online video of a man driving a model truck, so Luca decided to construct one for himself. Luca developed the cabin using fibreglass and a wooden frame, with plastic polish used to resemble chrome. After multiple hours of careful attention to detail, two 1.5mm steel pipes were used create a robust frame. Power comes from a 36v 750W electric motor that drives the twin rear wheels through a sprocket-drive chain. Since Luca didn't like the fact his truck was silent, he fitted it with a sound model, amplifier and two coaxial speakers. In addition, he installed a two-tone horn and a smoke-making device. With stats like 2,100mm long and a weight of 180kg (396lbs), you know this thing is anything but a toy. With all that torque on tap, the miniature truck hauls a Ford Mondeo wagon along with ease. After nine months of hard work, Luca said he plans to build a 5 metre long trailer for the model!